At Balhannah Dental Practice, we treat every patient like we would treat our own family. We will always explain every treatment option and dental procedure in depth so that patients can make the best decision for their particular situation. We only use the highest quality dental filling materials and are committed to performing the best dentistry we can for every single patient. 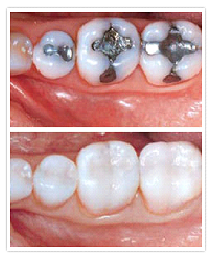 While some dentists may still use silver Amalgam after fillings. We at Balhannah Dental Practice have decided to only place white, mercury free fillings. Many patients that visit us are completely unaware that they have a cavity as they do not feel any pain at all. This is because the outer enamel coating of the teeth has no nerves. As are result, these teeth are unable to feel pain. When decay moves to the inner dentine core, then sensitivity may begin. Patients are sometimes caught off guard when they are shown a picture of a small cavity in their mouth as they have no pain, sensitivity or other symptoms. We recommend patients have their teeth checked every 6 months. This ensures if any problems occur, they can be fixed even before they start to cause pain. Finding and filling a small cavity before it starts to cause discomfort is cheaper and results in a stronger, longer lasting filling and tooth. This also prevents the need for more extensive treatment such as root canal, crowns or extractions.